What do I need to know before donating? Where and when can I donate? Jason and Devin McCourty are well known for their accomplishments on the field as two of the best defensive backs in the NFL, but now they have been recognized for their work in the community. 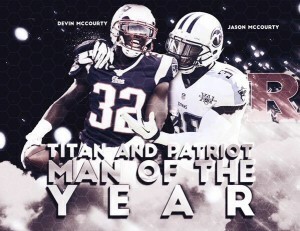 Both Jason and Devin McCourty were named Walter Payton Man of the Year by their respective NFL teams, the Titans and Patriots. In 2014 the Twins continued their partnership with Embrace Kids Foundation on a campaign against sickle cell disease. The campaign, entitled “Tackle Sickle Cell” aims to educate the public, increase blood donors, and raise money & awareness for the fight against sickle cell disease. Over the last year Tackle Sickle Cell held multiple events and blood drives throughout New Jersey and even expanded the campaign’s footprint to the home cities of their respective NFL clubs , Boston Massachusetts and Nashville, Tennessee. Below is a look back at some of the accomplishments from the McCourty Twins Tackle Sickle Cell Campaign the last 12 months.